Africanized honeybees, commonly known as "killer bees," are much more aggressive than their European counterparts. Now researchers have examined neuropeptide changes that take place in Africanized honeybees' brains during aggressive behavior. The researchers, who report their results in the Journal of Proteome Research, also showed they could turn gentle bees into angry ones by injecting them with certain peptides. In the 1950s, researchers in Brazil bred Africanized honeybees by crossing European and African bees. In 1957, swarms of the bees were accidentally released, and they have been buzzing their way across the Americas ever since. Scientists currently don't understand what makes these bees so aggressive, but the behavior appears to involve a complex network of genetic and environmental factors, regulated by neuropeptides. So Mario Sergio Palma and his colleagues wanted to examine neuropeptide differences between the brains of bees displaying aggressive and non-aggressive behavior. The researchers stimulated Africanized honeybees to attack by hanging spherical, black leather targets in front of their colonies. Angry guard bees quickly attacked the targets, becoming embedded in the leather by their stingers. Meanwhile, gentler bees kept their distance. 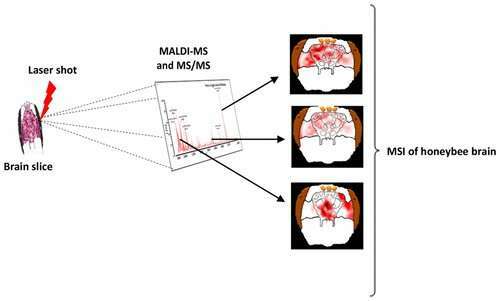 The researchers collected both groups of bees and analyzed their brains by mass spectral imaging. In the brains of aggressive bees, two longer neuropeptides were cleaved into shorter ones, but this did not happen in the gentler bees. The researchers then injected the shorter peptides into anesthetized, non-aggressive bees, which became combative upon waking. The study provides new insights into the neurological basis for aggressive honeybee behavior, the researchers say. Aggressiveness in honeybees seems to be regulated by multiple genes, under the influence of different factors, such as polyethism of workers, environmental factors, and response to alarm pheromones, creating a series of behavioral responses. It is suspected that neuropeptides seem to be involved with the regulation of the aggressive behavior. The role of allatostatin and tachykinin-related neuropeptides in honeybee brain during the aggressive behavior is unknown, and thus worker honeybees were stimulated to attack and to sting leather targets hung in front of the colonies. The aggressive individuals were collected and immediately frozen in liquid nitrogen; the heads were removed and sliced at sagittal plan. The brain slices were submitted to MALDI spectral imaging analysis, and the results of the present study reported the processing of the precursors proteins into mature forms of the neuropeptides AmAST A (59–76) (AYTYVSEYKRLPVYNFGL-NH2), AmAST A (69–76) (LPVYNFGL-NH2), AmTRP (88–96) (APMGFQGMR-NH2), and AmTRP (254–262) (ARMGFHGMR-NH2), which apparently acted in different neuropils of the honeybee brain during the aggressive behavior, possibly taking part in the neuromodulation of different aspects of this complex behavior. These results were biologically validated by performing aggressiveness-related behavioral assays using young honeybee workers that received 1 ng of AmAST A (69–76) or AmTRP (88–96) via hemocele. The young workers that were not expected to be aggressive individuals presented a complete series of aggressive behaviors in the presence of the neuropeptides, corroborating the hypothesis that correlates the presence of mature AmASTs A and AmTRPs in the honeybee brain with the aggressiveness of this insect.